After we review your submission, we will create your Annuity Comparison Report and email it to you within 1 business day. The reason it takes us up to 1 business day, is we have real people working to find the top 3 annuities based upon the information you provided. In addition to the report, we'll connect with a local Safe Money Places Agent Network Member. This person is a licensed agent in your state and will answer any questions you have regarding your report and/or annuities in general. ​If you need immediate assistance, please give us a call at 1-877-844-0900. 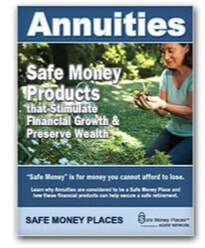 To further show our gratitude, please download our copy of our Safe Money Places Consumer Guide To Annuities.